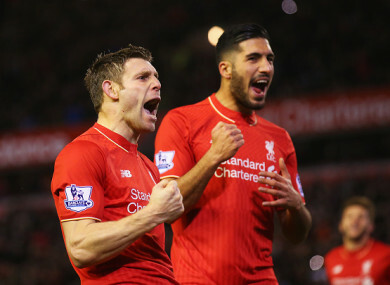 James Milner and Emre Can are both fit for Saturday's meeting with Real Madrid. EMRE CAN COULD feature for Liverpool in this weekend’s mouthwatering Champions League final showdown with holders Real Madrid. Manager Jurgen Klopp initially feared a back injury sustained against Watford in March would keep Can out for the remainder of the season. But the midfielder, who has been heavily linked with a move to Juventus, was back in training on Monday and Klopp revealed he was an “option” for Saturday’s match in Kiev. Meanwhile, James Milner has also been given the all-clear following a minor muscle problem. “Millie was clear [he would be fit] and Emre is a surprise,” Klopp told Liverpool’s official website. “He [Can] told me he would come back, try this and that and then we would talk to people. We thought it would be difficult, but he came back and from the first day it was like, ‘Okay, that looks good, how do you feel?’, ’Very good’ and then the next day ‘very good’ again. Juventus Chief Executive Giuseppe Marotta confirmed last week that the club hope to finish talks in the coming weeks, with a view to announcing Can’s arrival before the World Cup. “We are optimistic about a positive end to negotiations with Emre Can,” Marotta said last weekend. Liverpool will be out to stop Madrid being crowned champions of Europe for the third season running. The Reds last won the tournament in 2005, coming from 3-0 down to defeat AC Milan on penalties in Istanbul. Quiz: How well do you remember Liverpool’s European Cup-winning sides? Email “Emre Can and James Milner have been cleared to play in Saturday's Champions League final”. Feedback on “Emre Can and James Milner have been cleared to play in Saturday's Champions League final”.